As a change I thought I would start todays blog with a picture. It is a picture of yesterday's avalanche and you can clearly see the crown all the way across the top of Mamma Bear and the massive avi debris trail below. 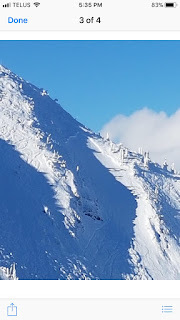 The only reason for including this is that as the official sites appear to be in complete denial of the existence of an avalanche yesterday I had thought that maybe me, and my buddies had imagined everything and this pic does at least confirm that we weren't dreaming. Temps warmed over night so that it was -5 on the way to the hill and snowing. Overnight figures reported that we had 1 cm of new snow although it looked way more by the time we were driving to the hill. I think this was because the snow had started late in the morning and not because the ski hill had decided to under report the amount of new snow - that will be the day. The day was an amazing day and perhaps one of the top days ever. It was snowing when we got to the hill and puked snow all day in full on winter conditions. I have no idea what the snow fall total was but we had to be looking at more than 20 cms. It tapered off a little towards the end of the day but by that time we had been swamped by as much deep powder as anyone could want. The crowds should all have gone home but I guess the conditions made them hold on and who could blame them, that having been said it never got that busy at any time during the day. We went to the New Side for all the reasons I explored yesterday to do with the iniquitous practice of selling first tracks to the highest bidder which takes place on the Old Side and which I find totally reprehensible. The New Side was great and everything was open, except of course Polar Peak and the Saddles. We hit out to Skydive and had first tracks all the way down which were of course awesome but when I say this was not the best run of the day it gives you an idea of just how good things got. After that first tracks became irrelevant as the snow was filling in so fast that we had first tracks everywhere even if others had been there first. We hit Cougar Glades and Touque/Chutes and Spinal Tap before they closed the Reverse Traverse. After that we hit Stag Leap and Decline/Window Chutes before they closed Currie Bowl for the day. The guys did their best to keep it open for as long as they could but with that much snow the closure was inevitable. There is no point in reporting on any of the snow as it was all deep, awesome and untracked where ever you went. Obviously we were not going to stop for lunch today so with Currie closed we hit Anaconda 1 followed by Don't Lose Me Trees . Next loop was Triple Trees and it would be an unnecessary waste of space to describe conditions in these area as snow was just getting deeper and more awesome as it did all day. We then decided to try the Siberia Ridge area and hit the Fraser Tooth into North East Glades and this was probably the best and deepest snow of the day. After that it was my good old favourite White Rabbit which was a little tracked up but actually was still deep and untracked off to the left of the creek bed. For the rest of the day we went into loops of Knot Chutes (mostly the Tight Knot, very deep) Anaconda Glades (Chutes 1,2and 3 all good and deep) and then trees off to the right of Bootleg which had loads of untracked lines. We had a great time in Griz bar after skiing which was more crowded than usual but good fun. As Sunday is my drinking day I had a few beers which may account for the slightly incoherent nature of tonight's blog. On the way home it was -3 with more snow called for tonight so tomorrow could be even better.